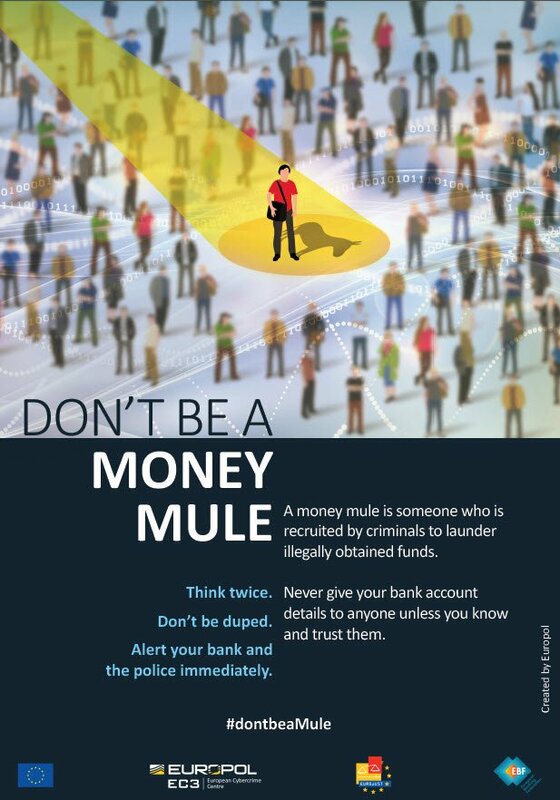 A money mule is a person who transfers illegally obtained money between different payment accounts, very often in different countries, on behalf of others. 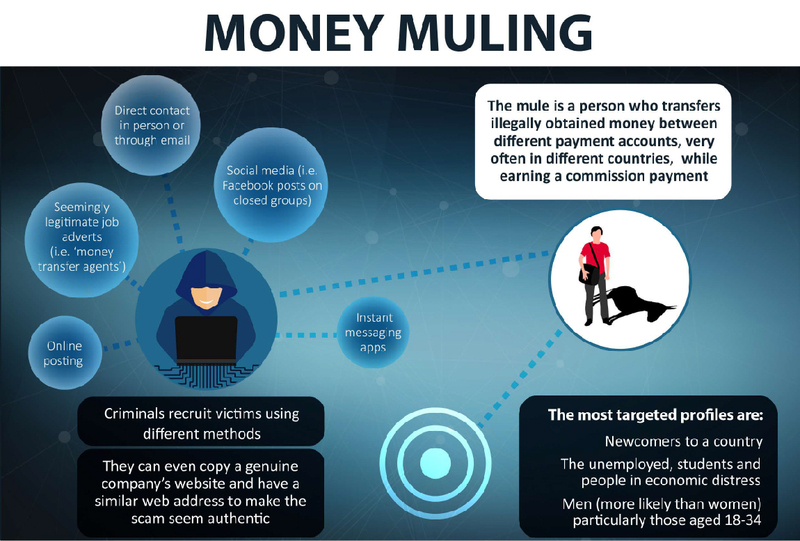 Money mules are also recruited by criminals to receive money into their bank account, in order to withdraw the money and in most cases wire it overseas, receiving a commission payment in return for the provided services. 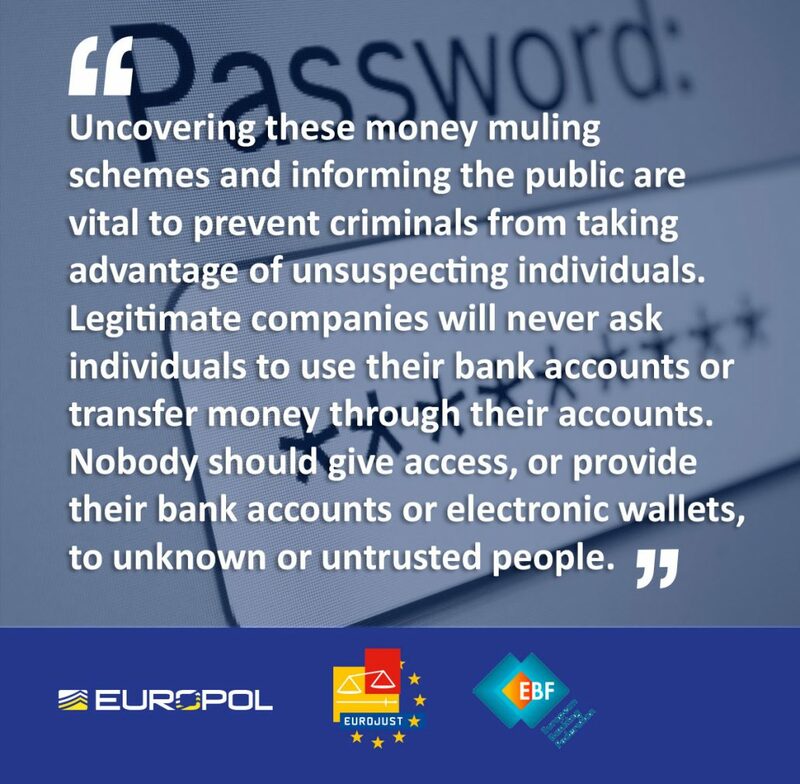 Even if money mules are not involved in the crimes which generate the money (cybercrime, payment and on-line fraud, drugs and human trafficking, etc. 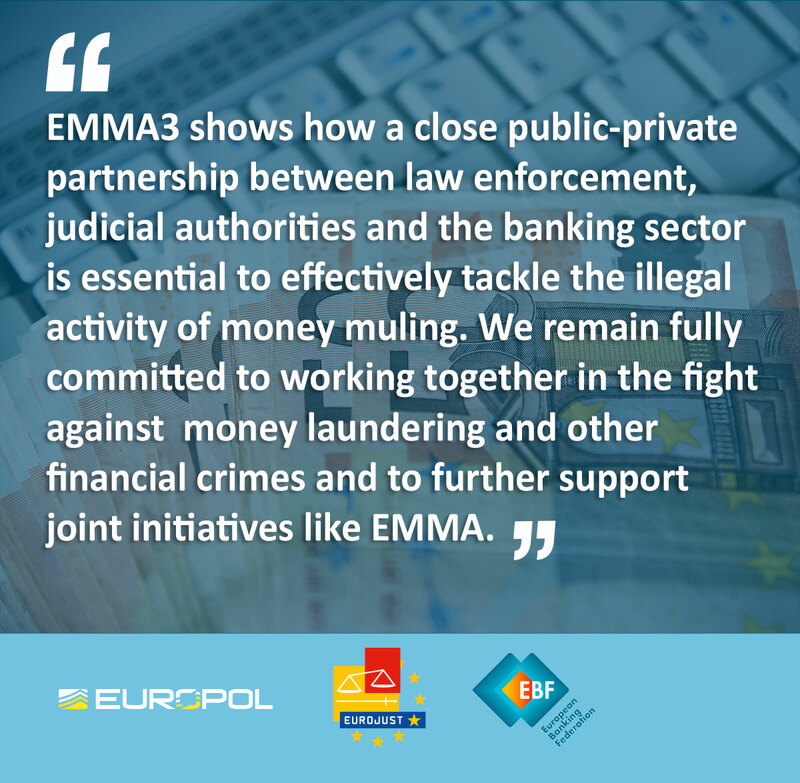 ), they are acting illegally by laundering the proceeds of crime, helping criminal syndicates move funds easily around the world and remain anonymous.. If you are caught acting as a money mule, even if done so unwittingly, you can face a prison sentence, fine or community service, and the prospect of never again being able to secure a mortgage or open a bank account. HOW ARE MONEY MULES RECRUITED? WHO ARE THE MOST TARGETED INDIVIDUALS? Newcomers to the country (often targeted soon after arrival) as well as the unemployed, students and people in economic distress are the most susceptible to the crime. Men are more likely than women to be targeted to become a mule, as are those aged 18-34 years compared to people aged 55+. Money mule adverts or offers may copy a genuine company’s website and have a similar web address to make the scam seem authentic. If done by email, the writing is often awkward and includes poor sentence structure with grammatical and spelling mistakes. The email address associated with the offer uses a web-based service (Gmail, Yahoo!, Windows Live Hotmail, etc.) 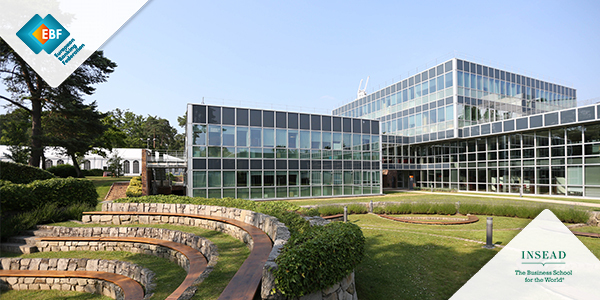 instead of an organisation-based domain. These adverts will normally state that they are an overseas company seeking ‘local/national representatives’ or ‘agents’ to act on their behalf for a period of time, sometimes to avoid high transaction charges or local taxes. All interactions and transactions will be done online. The offer promises significant earning potential for little effort. 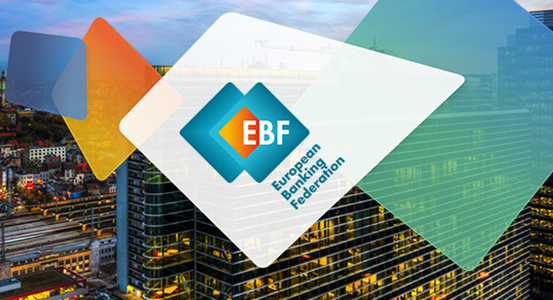 The nature of the work that the company will claim to be involved in can vary, but the specifics of the job being advertised invariably mean using your bank account to move money. If an opportunity sounds too good to be true, it probably is. Verify any company that makes you a job offer and check their contact details (address, landline phone number, email address and website) are correct and whether they are registered in your country. Look for the common warning signs as above explained, and do some research before agreeing to participate. If you have received e-mails of this type do not respond to them and do not click on any links they contain. Inform the police instead. 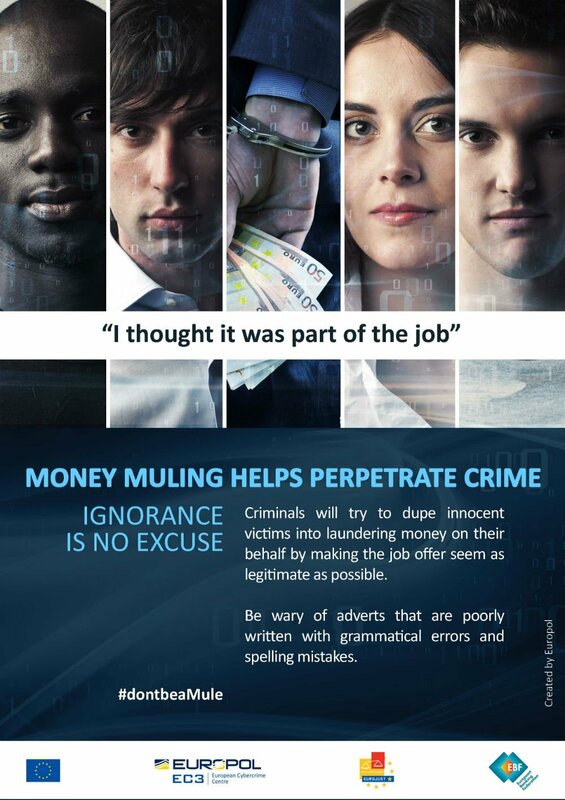 If after reading this flyer you believe that you are participating in a money mule scheme, stop transferring money immediately and notify your bank, the service you used to conduct the transaction, and law enforcement.